Note: This column was published on November 13, 2013 in the Barrow Journal. I don’t remember going on “play dates” when I was a little kid. When we lived in Oklahoma, I ran across the street to play with a friend who lived there, and when we lived in Colorado, I had a friend down the street and other friends from school that I might visit on the weekends. But we didn’t call it a date, and I don’t think my mom scheduled these play times weeks in advance. Now play dates dominate my calendar. Our homeschool revolves around them, and calling them dates is appropriate because some of them are planned a month in advance. Others are ongoing, bi-weekly play dates. They are exactly what they are called: it’s a date to play with friends. I make them a priority for my homeschooled children, but they are also for me. I just can’t stay cooped up in my house with my kids all week. We don’t know many of the neighborhood kids who are different ages and on a traditional school schedule, so I have to drive my children to parks or other people’s houses, usually 20-30 minutes away. 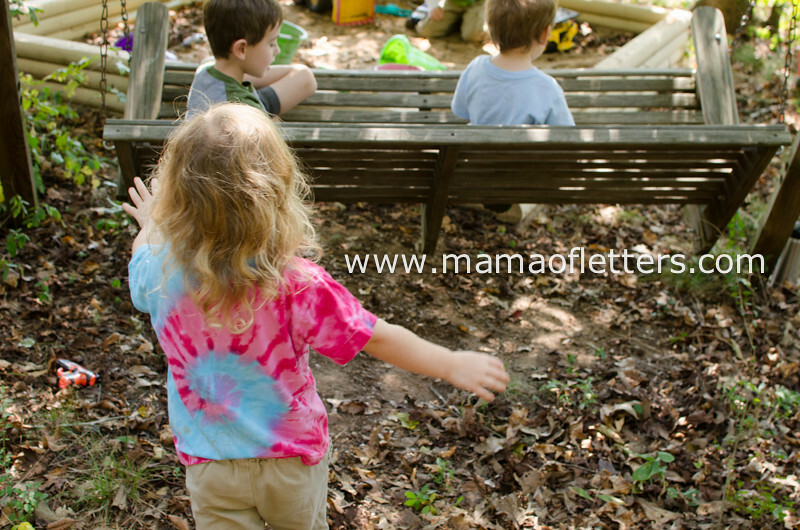 While I would love to say that I get to have nice conversations with other moms during these play dates, they are usually a lot of work. Younger children don’t always like to see Mama preoccupied with someone else, so they can make more work for her. I’ve experienced entire 3 or 4-hour play dates when all I achieved was a five-minute conversation because either the other mom or I were dealing with one of our children. Very small children don’t interact with each other very much, but fortunately, my four-year-old is beginning to get more independent, and he wants to run off with the bigger kids. My seven-year-old rarely needs me during a play date. So I’m starting to see light at the end of the tunnel, and in the past few months, I’ve finally experienced a few face-to-face conversations with another adult besides my husband! When we first decided to homeschool, I was worried about finding friends for my children. Though there are many homeschool families looking for friends, and local homeschool e-mail lists coordinate play dates, classes, field trips and other social get-togethers, my eldest son is introverted, so joining a big group of kids he didn’t know was difficult for him. He also needed to be with kids his own age or younger, so potential friends with older siblings weren’t the right fit, at least when he was four and five-years-old. I kept my eyes and ears open for other families with children the same age who were also new to homeschooling, and now, in our second year, our calendar is full. My son has bonded with these friends over long, regular play dates. Sometimes we get together in big groups, and since he has already met them one-on-one, joining group play is no longer a problem. This is in addition to all the classes and camps he participates in. Critics of homeschooling say that homeschooled kids won’t be socialized properly, but now I’m in the thick of homeschooling and see plenty of opportunities for socializing with people of various beliefs and backgrounds. If a parent is willing to find friends for their children, they have the opportunity to socialize for long periods of time when real interaction and old-fashioned play can happen. My son’s friends are polite and inclusive, and he encounters new children in his classes, camps and whenever new homeschoolers come on the scene. I’ve noticed that the new homeschooling moms have the same concerned look on their faces as I did just a year or two ago. I want to tell them that there’s nothing to fear. Get out there in the homeschooling community, and in a year or two, you’ll be wishing your calendar weren’t so full either. What does your calendar look like these days? I must say that getting enough play dates for my kids, especially my 5.5 yo daughter is a source of continual frustration for me. She has plenty of friends, (she gets invited to at least one or two birthday parties a month) but I have yet to meet another family that puts priority on play dates. We had a great weekly play date with a group of kids from the time she was a baby into toddlerhood and somewhat into the preschool years, but all those kids go to kindergarten now, some full day. Even the ones that only go half day are rarely available in the afternoon as they have other activities scheduled. I was hoping they would be more available during the summer, but their calendars were full of activities and camps and swim lessons then too. We’ve met many homeschoolers in the last year or so and do many activities with other homeschooled kids. Often the kids do get to play a bit, but I’ve found their schedules rarely accommodate regular play dates either. I know my daughter would love to have more 1:1 or small group time with some of her friends, but the majority if her socialization is in large groups. To be honest I’m getting pretty exhausted constantly reaching out to other moms and getting a lukewarm response as I’m just not naturally outgoing. It’s especially frustrating to me since I’ve talked to many of these moms (most of whom are my friends) about the importance of playtime for kids and they all agree with me – in theory – but obviously not in practice. Thanks for your comment, Peggy. I’m sorry to hear you are having trouble setting up playdates. I know it’s frustrating! I feel lucky to have one very reliable family we have bi-weekly playdates with. Another I wanted to have bi-weekly dates with but I’m lucky if we see them once a month. We’ve just met some others that I THINK we’ll be able to continue to see on a regular basis, but as schedules change and illnesses, etc., you never know. But between the few families we know and the classes we’re in, we stay pretty busy, and I feel like we’re finally getting some good socializing time, and I see that over time, new relationships may emerge. I know it’s exhausting….I’m introverted and would happy to be at home more, and I’ve had to learn to put my desires out there so people are aware we want friends. That’s not easy. There is nothing wrong with taking a break for awhile from trying and then try again later. Or especially around the beginning of the year, keep your eyes and ears open for new people. Have you put a query out on a local homeschool e-mail or Facebook group asking if anyone has a daughter that age who would like to meet one-on-one? Thank you so much! My name is Natalia and I live in Argentina. I have two sons, 3.5 and 1. I love your blog. .I´m homeschool mom.